Our eyes for your success! for KLT and paper boxes. 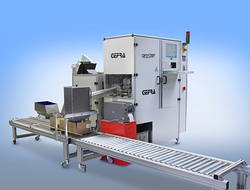 Based on the approved OPTISORT® product lines and technologies GEFRA offers highly automated and safe measuring, checking and sorting solutions with an output of up to 1000 parts per minute and more and also peripheral equipment and solutions for a comfortable daily work. 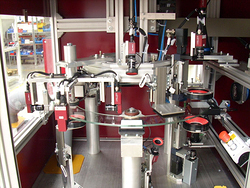 Since 1995, the GEFRA Company is developing and manufacturing inspection systems for automotive and aircraft fasteners and other bulk products. GEFRA OPTISORT systems ensure an efficient 100 percent automatic quality control where a cost efficient and zero ppm error quote is needed. More than 260 systems all over the world are speaking in the GEFRA Company’s favor. GEFRA OPTISORT systems offer a wide range of state-of-the-art applications for measuring dimensions on fasteners like washers, nuts, screws, springs, bolts etc. Using different imaging and illumination technologies, complex geometric measurements, inspections for damages like scratches, dents, points of impact, cracks, errors in color and surface coatings and much more can be realized. The approved PC-based system software AUTOCONTROL made by GEFRA itself does the image processing and generates the IO/NIO decision with the help of an individual quality control plane, which includes all important parameters of the part. GEFRA’s engineers have recently extended the number of control parameters stored in this check plan. 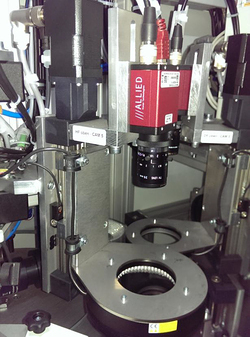 One important origin for errors in reproducing results could be eliminated: the mechanical adjustment of light position for top-light applications. Now as an option, all top-light illuminations can be adjusted by using electrically driven linear axis. The precision of readjusting a stored position is better than 0.2 mm. All types of top-light illuminations can be motorized using this option. In this way the repeatability of results for both, measuring and surface inspection tasks can be significantly increased. To make the daily work with OPTIOSORT systems more comfortable, the GEFRA Company offers a lot of solutions for machine networks and remote programming of AUTOCONTROL software. Network solutions are available for automated backups of system software and check plans. Using a central server station with for instance a 2T Byte hard disk, a daily storage is possible. Machines of other vendors can be also integrated into this network. For remote control and programming of OPTISORT systems GEFRA offers a desktop workplace. Using this workplace, first remote desktop operations are possible. With these the AUTOCONTROL software and so the machine can be controlled and programmed by the operator in the office in the same way as in front of it. Also copy operations to other systems are possible. Further a standalone version of AUTOCONTROL is available. While the machine is running, a new check plan can be arranged when calibration images are available. Also access to statistic functions of the system is possible. The GEFRA product portfolio is complemented by a wide spectrum of offers in the fields of accessories also for packaging, service, maintenance and training. A high availability of spare parts and a short reaction time to all cases around a sorting system is guaranteed by the GEFRA team. So the GEFRA Company is a reliable partner for all-in-one’s quality applications in the field of fastener manufacturing.